Skinny Moo Shu Pork stir fry made with lean pork tenderloin, cabbage, carrots, bamboo shoots, mushrooms and onions served with a drizzle of hoisin sauce. Stir Fry Chinese recipes are at the core of our weekly meal rotations. We are such creatures of habit that finding takeout copycats we can keep enjoying as often as we’d like (and in BIG portions) keep us satisfied and on track. 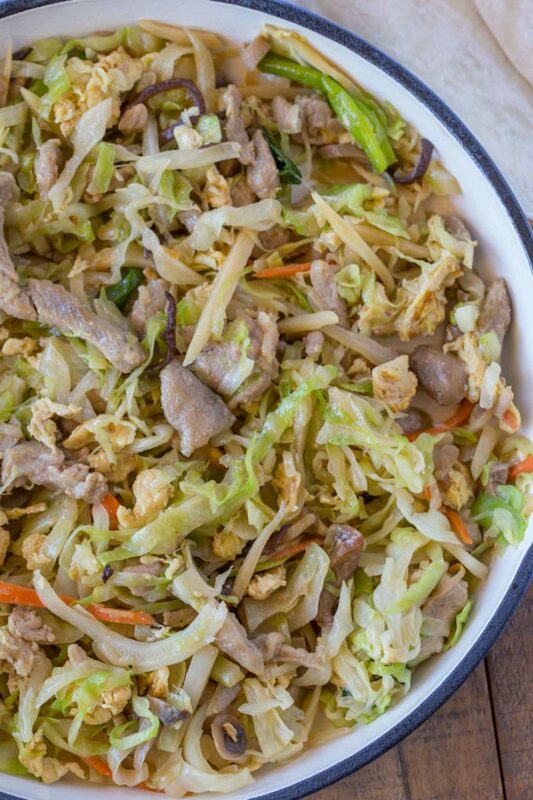 This Moo Shu Pork (sometimes called Mu Shu Pork) is the PERFECT Chinese meal made at home. You get a really large serving for a small amount of points. My happy place is eating large servings of delicious food. What is Moo Shu made of? 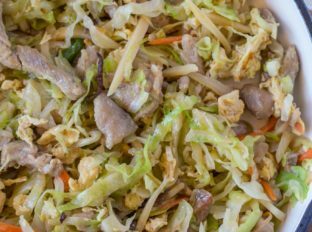 Moo Shu Pork is similar to a grown up version of the inside of an egg roll. 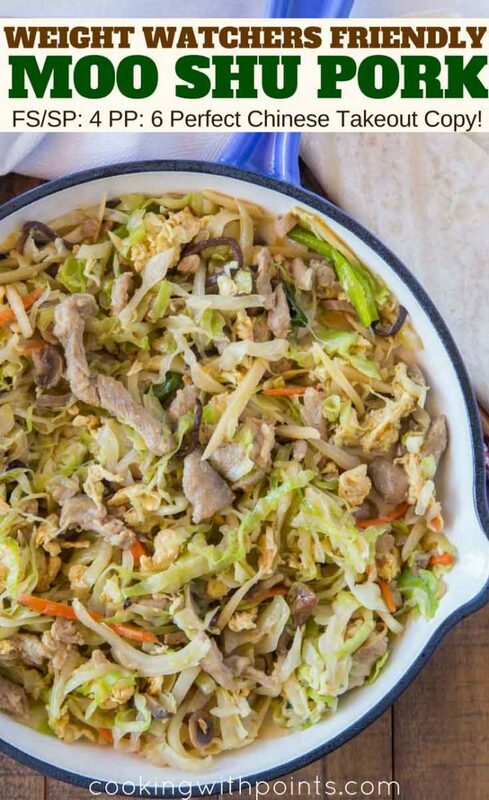 Made with cabbage, carrots, pork, garlic and ginger in a hoisin-sherry sauce, this easy pork stir fry dish is going to be a family favorite you go back to over and over again. 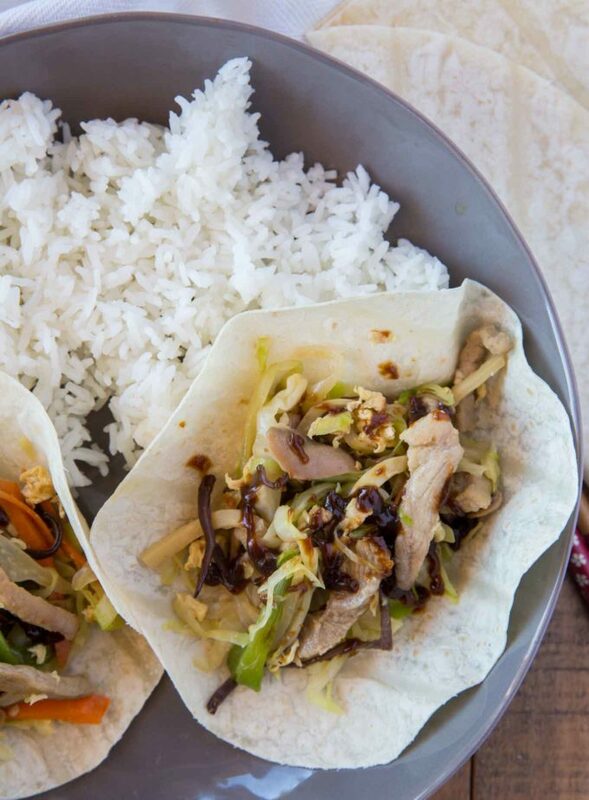 What to serve with Moo Shu Pork? 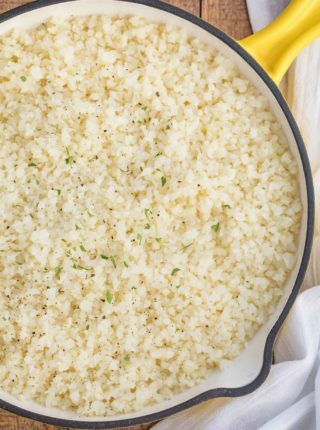 We love to serve this over cauliflower rice (my favorite is cauliflower fried rice which is coming soon), brown rice or steamed vegetables. What sauce is served with Moo Shu Pork? The sauce you commonly see served along side moo shu pork is hoisin sauce. Hoisin sauce is similar to a bbq sauce, with a sweet flavor. It is not low in smart points, clocking in around 2 points per tablespoon. 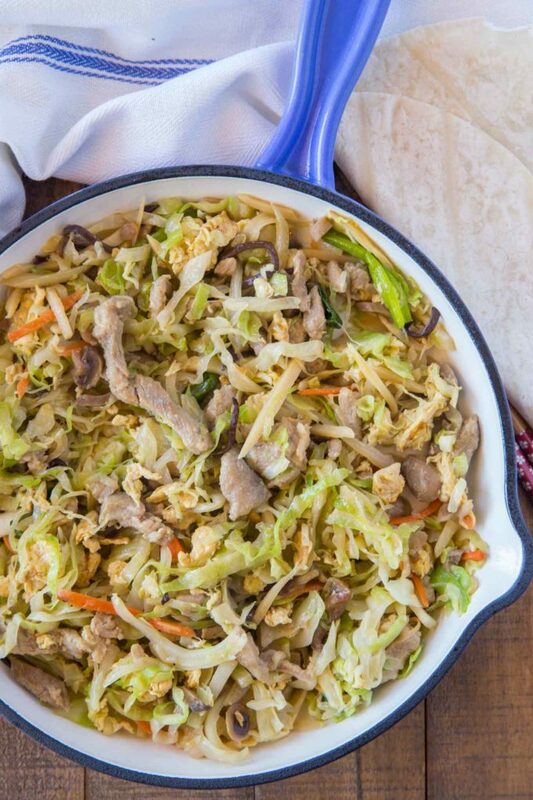 The most authentic way to serve moo shu pork was to serve it in Asian pancakes. I usually eat them with low point flour tortillas but we have gone all out a couple of times and made these pancakes for 2 smart points per pancake. Add the flour to a stand mixer bowl with a dough hook then mix in the boiling water. Let the mixer go on medium speed until the flour and water together until it comes together into a ball. Knead for an additional five minutes. Knead for an additional 1-2 minutes. Cut dough into 16 pieces, then roll into tortilla shapes. 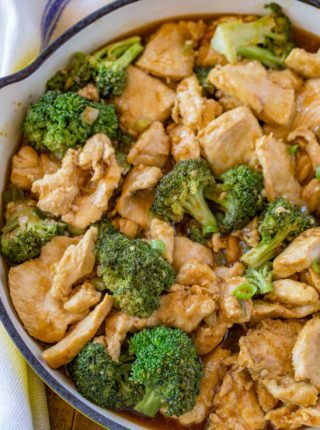 Brush with sesame oil and cook in a dry pan on medium heat for 15-20 seconds on each side. Add one tablespoon of canola oil to the skillet on medium-high heat. Add the pork tenderloin to a bowl and toss with soy sauce. Add the pork to the skillet and cook through for 2-3 minutes before flipping, then an additional 2-3 minutes. Remove the pork from the pan, reduce the heat to medium, and add in the eggs, chopping them up with a spatula into fine pieces as they cook. Remove the eggs from the pan and add in the remaining canola oil, garlic, ginger and mushrooms, stirring well and cooking for about 1-2 minutes. Add in the cabbage, bamboo shoots, and carrots and stir well. Add in 2 tablespoons of water and stir, then cover and let steam for 2-3 minutes. Add in 2 tablespoons of hoisin sauce, dry sherry and green onions and stir well. Serve in small pancakes with remaining 2 tablespoons of hoisin sauce (1 teaspoon per serving). This is so easy to make and I have all of these ingredients! I love this lighter version! The lighter pancakes sound delish! I may be hard for me to drizzle the sauce because I love it! You’re right, Dorothy! 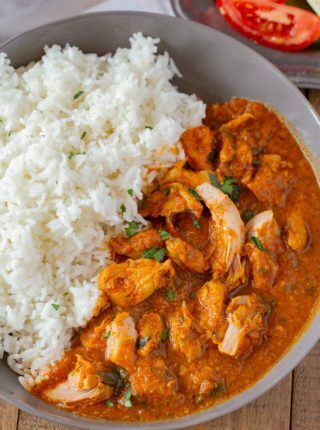 It can be hard to limit your sauce usage when it’s so delicious! Looks delicious! I love stir fry recipes! I love this! And I am sure my family will enjoy this too! What a dinner! Looks so delicious! What a great pork dish! Have to make it for dinner soon! This was fantastic! My local Chinese place sets a pretty high bar for Moo Shu Pork, and this recipe did not disappoint. I subbed sliced white onion for the bamboo shoots – per my taste. So happy I found your site via your guest post on Skinnytaste. Thanks for another winner! Lisa, so glad my recipe was able to live up to that high standard! 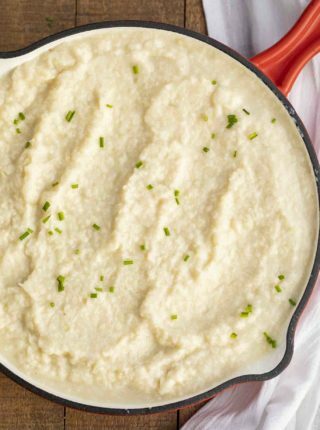 What are the points for this recipe? I’m so sorry Mary, Weight Watchers Inc. asked me to remove them all from the site per their copyright and trademark protected rights. looks really great. do you know what the point value is on the pancakes? The company that uses “points” has reached out to me claiming points are proprietary and demanded that I stop sharing them with my recipes. Sorry, but I can’t help you with that.